Cesar Villalobos, director of the music and dance group Inca Son, which performs music of Peru's Andes Mountains, drums for his dancers. A group of Native American soldiers and Marines stationed at an air base near Fallujah in western Iraq in 2004 fashioned the drum, stretching the tarp from a cot across the top of a 55-gallon barrel. They wanted to hold a powwow in the middle of the war zone, and a drum is an intrinsic part of the ceremony. "We were missing our powwow," said Staff Sgt. Debra Mooney of the Oklahoma-based 120th Engineer Battalion of the Army National Guard, recalling the ceremony outside Fallujah. "In our hearts and minds, we were right at home." It was an unforgettable night: "Usually, the faces of the soldiers are serious, focused and look older than they are," Mooney said. But that night, "they looked like young men and women again." 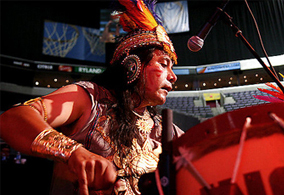 The makeshift drum was at center stage at Verizon Center yesterday, where the third National Powwow is continuing this weekend. On opening day, veterans of the Iraq and Vietnam wars, some in military uniform, marched to the beat of drums as part of a tribute to the "fallen warriors" and to the troops serving in Iraq and Afghanistan. The National Powwow, which continues through Sunday, is sponsored by the Smithsonian's National Museum of the American Indian. It is held every two years and is one of dozens held throughout the country from spring to fall. The powwow season starts in March and extends through next month in cities across the country. The National Powwow is the largest Native American event in the region, organizers said. The goals are cultural and educational, said Leonda Levchuk, a museum spokeswoman. For the powwow, the Verizon Center convention floor was transformed by the presence of Native Americans from about 250 tribes. One thousand dancers, many dressed in fringed deerskin dresses and feather hats, performed a variety of dances throughout the day. (More).